Big Bear stores were founded in 1933 by Wayne E. Brown in Columbus, Ohio. They were a regional supermarket chain in Ohio. 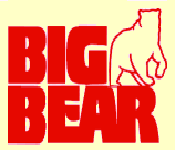 Before the companies downfall they had 21 Big Bear Plus Stores. In 2004 they filed for their second and last chapter 11 bankruptcy.